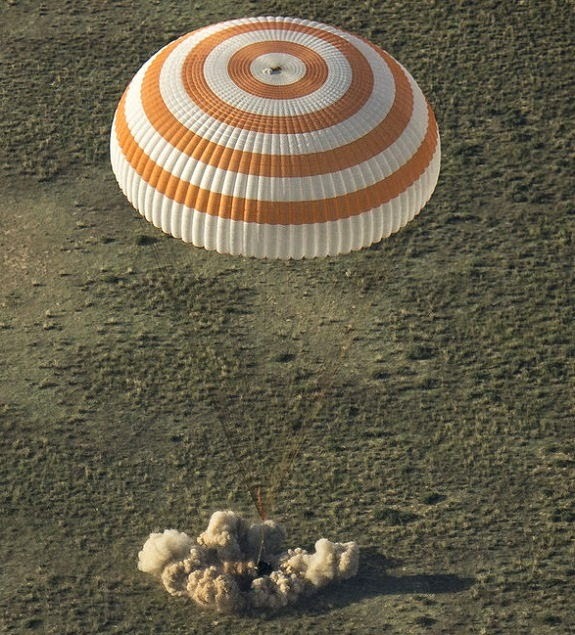 HOUSTON, Texas -- The International Space Station Expedition 39 crew returned to Earth Tuesday after 188 days in space. The Soyuz TMA-11M spacecraft carrying Expedition 39 Commander Koichi Wakata of the Japan Aerospace Exploration Agency, Soyuz Commander Mikhail Tyurin of Roscosmos, the Russian Federal Space Agency and Flight Engineer Rick Mastracchio of NASA landed in the steppe of Kazakhstan southeast of Dzhezkazgan at 9:58 p.m. (7:58 a.m. Wednesday, Kazakh time). Helicopters carrying the Russian recovery teams and NASA personnel reached the landing site shortly afterward to assist the crew and conduct medical examinations. The Soyuz undocked from the Rassvet module on the Earth-facing side of the station at 6:36 p.m. as the station soared 261 statute miles over Mongolia. The 4-minute, 41-second deorbit burn beginning at 9:04 p.m. slowed the Soyuz for its decent into the Earth’s atmosphere and its parachute-assisted landing. During Expedition 39, the crew participated in a variety of research, including a human immune system activation and suppression study and a protein crystal growth research study looking for proteins responsible for Huntington's disease and other neurodegenerative conditions. The crew also installed a new plant growth chamber designed to expand in-orbit food production capabilities. Expedition 39 also saw the arrival of three cargo spacecraft to the orbiting complex -- a Russian Progress resupply vehicle, Orbital Sciences' Cygnus cargo ship and SpaceX Dragon. Mastracchio performed three contingency spacewalks during his stay aboard the station. The first two were to remove and replace a faulty cooling pump, and the third to remove and replace a failed backup computer relay box.